Do you need to be picked up or taken to at the airport? Animas Transportation offers quality ground transportation in the Four Corners area that is customer service driven. Their drivers are prompt and reliable and will get you to your destination safely. 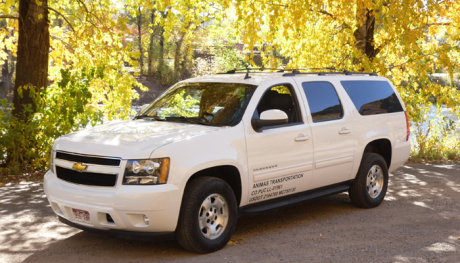 Animas Transportation is Durango’s full service transportation option. Whether you need a ride to or from the airport, around the Durango area, or to a nearby community in Southwest Colorado, Animas Transportation will take you where you want to go. Transportation to the Durango Airport (La Plata County Airport) from a pick up location inside of the Durango city limits. Transportation to the Durango Airport (La Plata County Airport) from a pick up at a Purgatory Resort area location. Pricing is the same for up to 5 people and includes pick up at Purgatory Resort Village, Cascade Resort Village, Needles and the Silver Pick Lodge. Transportation from the Durango Airport (La Plata County Airport) to a drop off location inside of the Durango city limits. Transportation from the Durango Airport (La Plata County Airport) to a drop off location at Purgatory Resort. Pricing is the same for up to 5 people and includes drop off at the Village at Purgatory Resort, Cascade Resort, Needles and the Silver Pick Lodge. Shuttle Service Durango to Telluride in a Suburban which can seat up to 6 adults. Transportation from in-town (city limits) Durango to a drop off location at Durango Mountain Resort. Pricing includes up to 2 people and drop off at DMR, Purgatory Village, Cascade Village, Needles and the Silver Pick Lodge. Transportation from in-town (city limits) Durango to a drop off location at Durango Mountain Resort. Pricing to include up to 2 people and drop off at DMR, Purgatory Village, Cascade Village, Needles and the Silver Pick Lodge. Transportation from in-town (city limits) Durango to a drop off location at Durango Mountain Resort. Pricing includes transportation for 3 people and drop off at DMR, Purgatory Village, Cascade Village, Needles and the Silver Pick Lodge. Transportation from in-town (city limits) Durango to a drop off location at Durango Mountain Resort. Pricing includes transportation for 4 people and drop off at DMR, Purgatory Village, Cascade Village, Needles and the Silver Pick Lodge. Transportation from in-town (city limits) Durango to a drop off location at Durango Mountain Resort. Pricing includes transportation for 5 people and drop off at DMR, Purgatory Village, Cascade Village, Needles and the Silver Pick Lodge. Transportation from Durango Mountain Resort to an in-town (city limits) Durango drop off location. Pricing is for 1 person and includes pick up at DMR, Purgatory Village, Cascade Village, Needles and the Silver Pick Lodge and drop off inside of Durango's city limits. Transportation from Durango Mountain Resort to an in-town (city limits) Durango drop off location. Pricing is for 2 people and includes pick up at DMR, Purgatory Village, Cascade Village, Needles and the Silver Pick Lodge and drop off inside of Durango's city limits. Transportation from Durango Mountain Resort to an in-town (city limits) Durango drop off location. Pricing is for 3 people and includes pick up at DMR, Purgatory Village, Cascade Village, Needles and the Silver Pick Lodge and drop off inside of Durango's city limits. Transportation from Durango Mountain Resort to an in-town (city limits) Durango drop off location. Pricing is for 4 people and includes pick up at DMR, Purgatory Village, Cascade Village, Needles and the Silver Pick Lodge and drop off inside of Durango's city limits. Transportation from Durango Mountain Resort to an in-town (city limits) Durango drop off location. Pricing is for 5 people and includes pick up at DMR, Purgatory Village, Cascade Village, Needles and the Silver Pick Lodge and drop off inside of Durango's city limits. Cancellation | Cancellations inside of 24 hours are non-refundable. Other | Cancellations inside of 24 hours are non-refundable.